New utility pouch designed for holding technician 1st aid kits and tools. Made in 1000D milspec Cordura nylon, the 1st aid utility pouch opens over three quarters of the way to give excellent folding-out access to contents inside. The pouch itself is 17.5x12x5.5cm in size, giving an internal volume of approximately 1155 cubic centimetres. Internally, the pouch has a flat, velcro down pocket and three double elastic, vertical retaining straps on the outer (opening away from body) side. The other (affixed to body) side has two wide horizontal elastics to help strap down larger packages, such as large field dressings. 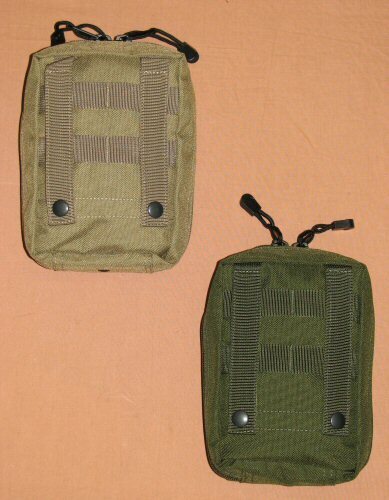 The outside of the pouch has a pocket of mesh which is double secured with velcro and reinforced at the bottom with a layer of Cordura webbing. This enables storage of packaged and sealed flat items which may have to be kept visible or easily accessible. The pouch has a rivetted drainage hole at the bottom. 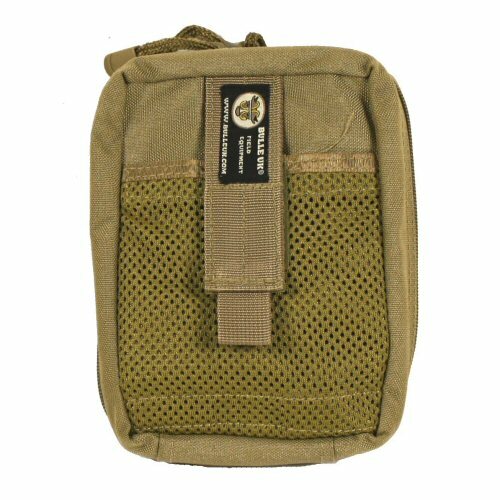 The rear of the pouch has two button down MOLLE straps and two horizontal webbing straps to enable sturdy and stable interweaving of the straps into the vest or panel. Zips are fitted with pull cords which help to silence the equipment. Pouch is hinged with two elastic straps when fully unzipped to prevent the pouch from opening to 180 degrees. A versatile utility pouch that keeps everything in its place. Please note that the price is for ONE pouch only. All accessories shown are for illustration purposes and are not included with the pouch. 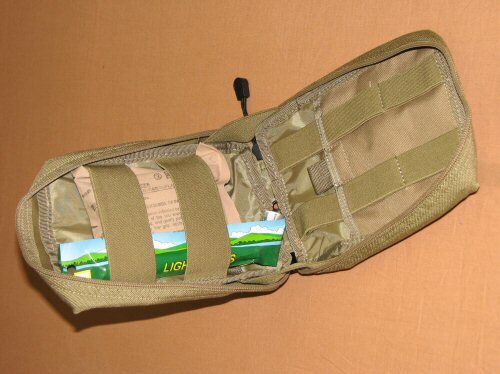 Search terms: medic pouch, multifunction pouch, MOLLE pouch, 1st aid pouch, multipocket pouch, zip pouch. Rear view of pouch showing securing straps. The straps can be interwoven with the vest base to provide more stability to the pouch. Illustration of of accessories which may be stored inside the pouch. The pouch organises all the items within so that they remain in place when the pouch is opened.